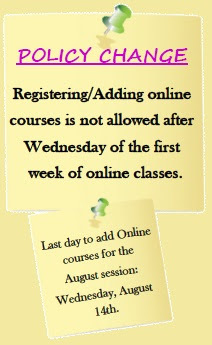 Don't forget that the August Session is the first session for which the deadline for adding online classes has changed. You can now add online classes only through Wednesday of the first week that online classes start. That's this Wednesday, Aug. 12! So hurry and add those online classes before it's too late!